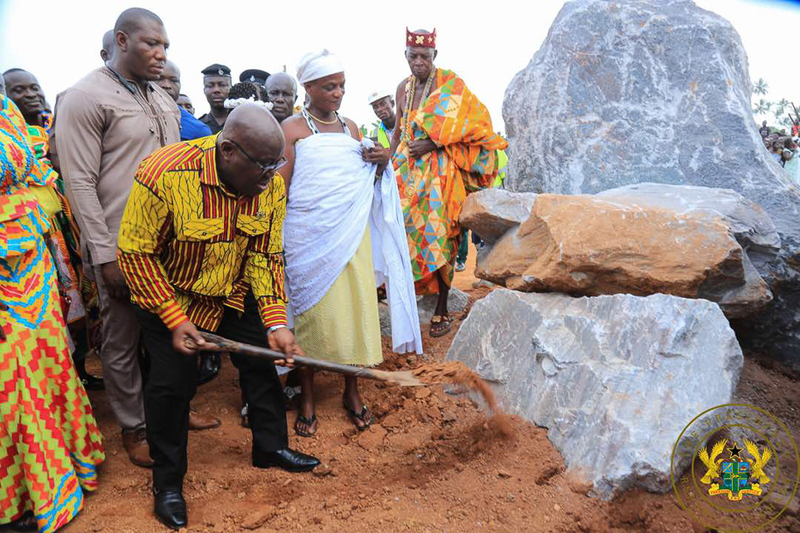 President Akufo-Addo Cuts Sod For Construction Of Axim Sea Defence Wall – NPP USA Inc. The President of the Republic, Nana Addo Dankwa Akufo-Addo, on Sunday, 9th September, 2018, cut the sod for the construction of the Axim sea defence wall, in fulfillment of the pledge he made to the people of Axim, in the run-up to the 2016 general elections. The sea defence wall project, which is being undertaken by Makam Plant Hire Ltd., is expected to be completed in some 24 months, with the contractors assuring the President of the prompt execution of the project. Speaking at Axim, at this year’s Kundum Festival, prior to the cutting of the sod, President Akufo-Addo recounted his visit to Brawire, in Axim, in 2016, where he witnessed, at firsthand, the devastation caused by tidal waves to the community. He, therefore, pledged that if the people of Axim and, by extension the people of Ghana, voted him into office, he would ensure the construction of the sea defence wall. “Today, I am here to fulfill this promise. Axim is the birthplace of George Alfred Paa Grant, and we are doing this in his honour, as well as to secure the lives and properties of residents of Axim,” he said. Touching a request by Awulae Attibrukusu III, Chief of Axim, for the construction of Axim town roads, the President indicated that the Minister for Roads and Highways, Hon. Kwasi Amoako-Atta, would, in a fortnight, cut the sod for the construction of the roads in the constituency. 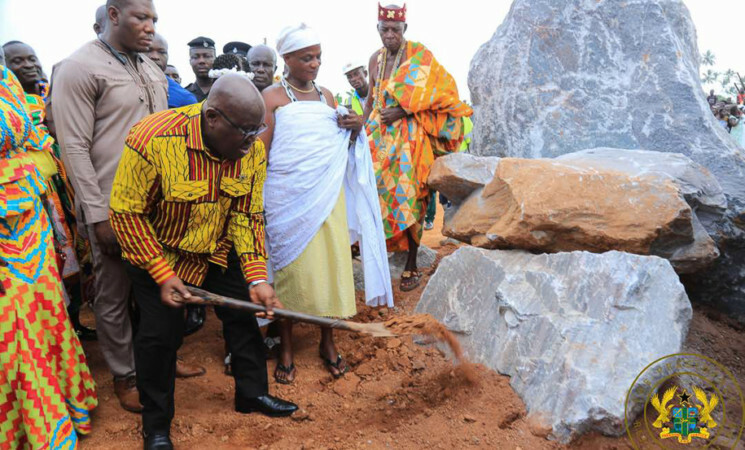 In addition to the construction of a sports stadium at Dr Beamish, a surburb of Axim, the near completion of the Driver and Vehicle Licensing Authority (DVLA) at Axim junction, President Akufo-Addo also revealed that the Victoria Park, would also undergo significant transformation into a well-designed ceremonial ground. With Evalue-Gwira being largely a cocoa growing area, the President announced that Evalue-Gwira has been as a cocoa district, with cocoa farmers no longer having to travel to Amenfi Central, Prestea Huni Valley, Ahanta West and Ellembelle to receive their inputs. On education, President Akufo-Addo stated that over 1,200 school children in Evalue-Gwira have so far benefitted from the Free SHS policy, with more to be absorbed this year. He also announced that Nsein SHS has been selected by government as a model school, which will result in the expansion of infrastructure of the school. Touching on the lack of communication and network services for the vast majority of the people in the constituency, the President indicated that the Ghana Infrastructure Fund for Electronic Communication (GIFEC), through its rural telephony project, has provided network services to Gwira Banso, Gwira Kutukrom, Gwira Asowa, Gwira Ashiem, Gwira Dominase. Additionally, the President stated that some two weeks ago, communities such as Gwira Wiaso, Gwira tumentu, Gwira abrodiem and Gwira eshiem were connected to the national electricity grid, and in the 2019 budget, for the first time since independence, Gwira roads will receive attention. With this year’s Kundum Festival addressing issues of peace and security and the role of traditional authorities, President Akufo-Addo noted that, through the Security Services Housing Project, a total of 40,000 well-planned housing units for personnel of the security services in the country are being put up. By the end of 2018, he added that a total of 4,000 new recruits would have been absorbed into the Ghana Police Service Training Schools across the country, and would pass out by the first quarter of next year. To equip the Police better, President Akufo-Addo noted that at least 1,000 new vehicles are being procured for the Police this year. Already 200 pick-up vehicles have been allocated under Operation Calm Life. 105 out of 200 Toyota saloon vehicles were delivered a few weeks ago to the Police.